Beef jerky is a nutritious snack, and it's pretty easy to make. With the right recipes, you can make many types of tasty beef jerky. Sweet and a little spicy, this jerky is flavored with spicy jalapeños and tasty cola. Use regular (not diet) cola. Yields about eight 2-ounce servings of jerky. In a small saucepan on medium-high heat, whisk together the cola, lime juice, lime zest, jalapeño, soy sauce, honey, and onion powder. Simmer for 5 minutes, stirring frequently. Pour the mixture into a large zipper bag. Trim any excess fat from the sirloin and add the strips of meat to the bag with the marinade. Make sure the strips are completely covered with marinade. Seal the bag. Refrigerate for at least 24 hours, and for up to three days. Continue, using the instructions below for making the jerky in the oven, a dehydrator, or smoker. 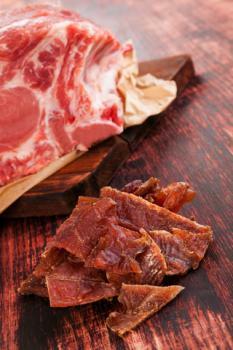 Jerky (beef) jerky (or jerky squared) is sweet, spicy, and fragrant with the flavors of the islands. It is a lively flavoring for the dehydrated beef, and one you're sure to enjoy. In the bowl of a food processor or blender, combine the ginger, garlic, chilies, onions, green onions, cilantro, allspice, cinnamon, thyme, black pepper, nutmeg, salt, lime juice, apple cider vinegar, brown sugar, olive oil, and soy sauce. Pour the paste into a large zipper bag. Add the beef strips, adding water as necessary to make the paste cover the beef completely. Seal the bag. Refrigerate for 24 hours to three days. Dry the jerky in the oven, smoker, or dehydrator as outlined below. Sweet mango adds a tropical flavor to this beef jerky while habanero chili peppers bring the heat. The result is a sweet, spicy jerky with the flavor of the islands. In a food processor or blender, combine the mango, chili peppers, red onion, grated ginger, lime juice, apple cider vinegar, honey, cumin, turmeric, soy sauce, and black pepper. Process until smooth. Pour the marinade into a large zipper bag and add the meat slices, making sure the marinade completely covers the meat. Seal the bag and refrigerate it for 24 hours to three days. Proceed with the oven, smoker, or dehydrator instructions below. You don't need any special equipment to make beef jerky. You can make all the tasty recipes in your oven, dehydrator, or smoker, which makes it convenient to make a batch of jerky whenever you want. Preheat the oven to 175 degrees Fahrenheit. Use a thermometer to ensure you maintain this temperature throughout cooking. Spray your oven racks with nonstick cooking spray. Remove the beef from the marinade and pat it completely dry with paper towels. Place the beef directly on the prepared oven racks and put them in the preheated oven. Allow the jerky to stay in the oven until it is completely dry -- anywhere from 2 to 5 hours depending on the thickness of the cuts. Allow the jerky to cool on wire racks before storing. Remove the meat from the marinade and blot it dry with paper towels. Put the strips of beef on the dehydrator's trays. Turn the dehydrator on to its highest setting. Allow the meat to cure until it is dry, about 4 hours. Set your smoker to 175 degrees Fahrenheit. Use a wire brush to clean off the rack of your smoker and spray it with non-stick cooking spray. Remove the meat from the marinade and pat it dry with paper towels. Put the strips directly on the smoker rack. Smoke with the grill closed, checking the meat every 30 minutes or so. Remove the beef when it is dry but still flexible, 4 to 5 hours. Whether you make the jerky recipes above or you try your hand at organic beef jerky, if you store it properly, your jerky will keep for up to three weeks. Store it in a tightly sealed container or zipper bag and refrigerate it. You can also freeze your jerky, tightly sealed, for up to six months. Making your own recipes of delicious jerky isn't difficult. Make a sweet, tart, and spicy marinade like those above and then use whichever cooking method you have on hand to create this healthy and fun snack.